The Digital Research Library of Illinois History Journal™: Chicago's Grant Park Band Shell history. The city of Chicago officially designated the land east of Michigan Boulevard as a park in 1844, calling it Lake Park. The city had promised its people that the park would remain public land, vacant, with no buildings. This promise, though tested, would hold, with the exception of the Art Institute being built in 1892. 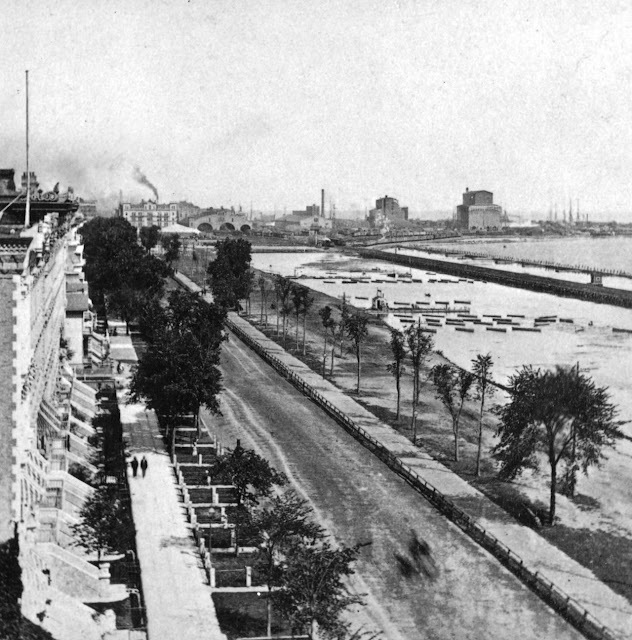 Looking north on Michigan Boulevard in 1868, with the homes of prosperous businessmen on the left. Lake Park was nothing more than a marsh-filled lagoon, with rail lines on the right, between Lake Michigan and the lagoon-like area. The estimated vantage point of this photo is from where Congress Avenue is now located. This is an 1890's view of the Lake Park area looking north, showing how cluttered it was with rail yards and tents. Civil War veterans camped in the park in 1890. 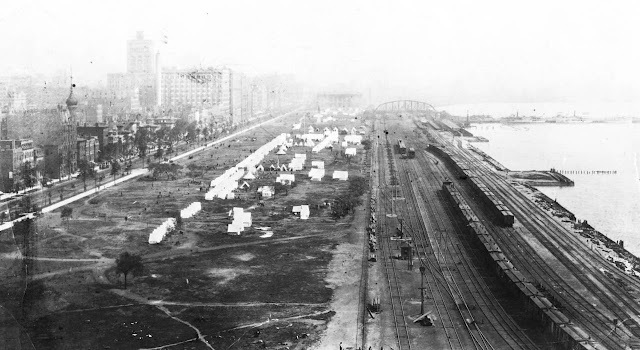 Troops camped in Grant Park in 1894 during the Pullman strike and a reunion. In 1901 the park was renamed Grant Park in honor of U.S. President Ulysses S. Grant. 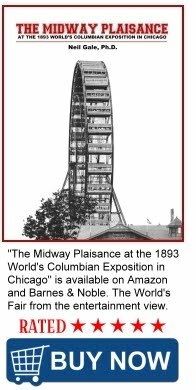 In the 1920s and 1930s, the Museum Campus was added to the park with more landfill, featuring the Adler Planetarium, Field Museum of Natural History, and Shedd Aquarium. In 2004, the northwest corner of the park was renovated and renamed Millennium Park, featuring several famous art installations. In 1915, the South Park Commission located a temporary wooden bandshell in Grant Park near Michigan and Congress Avenues. It hosted large events as well as band performances and remained in place for five or six years. In 1931, Mayor Anton Cermak suggested free concerts to lift spirits of Chicagoans during the Great Depression. The Depression and the proliferation of new technological innovations such as records, radios and "talkies" (films with sound) led to a declining demand for live music and a shrinking job market for musicians. 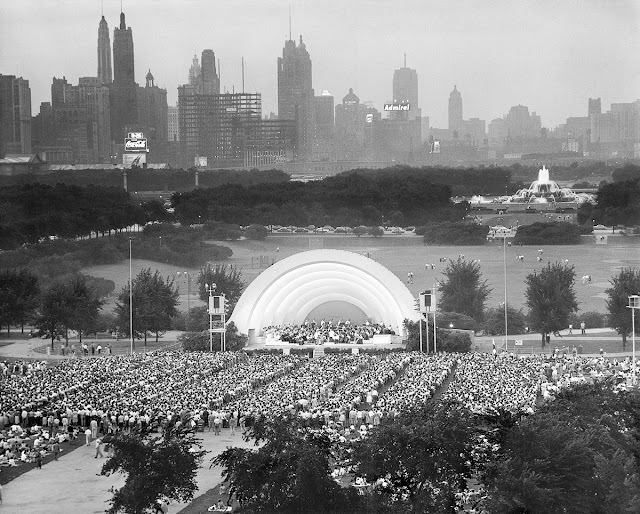 That year, as buildings were being built for the 1933 Century of Progress International Exposition, the Chicago Concert Band Association offered to organize a seventy-person concert band to give free summer concerts if the park commissioners would build a band shell that had electric lighting and dressing rooms. Construction on the wood and fiber E. V. Buchsbaum design began on a budget of $12,500, and the opening of free concerts commenced on August 24, 1931. Construction was completed in three weeks. 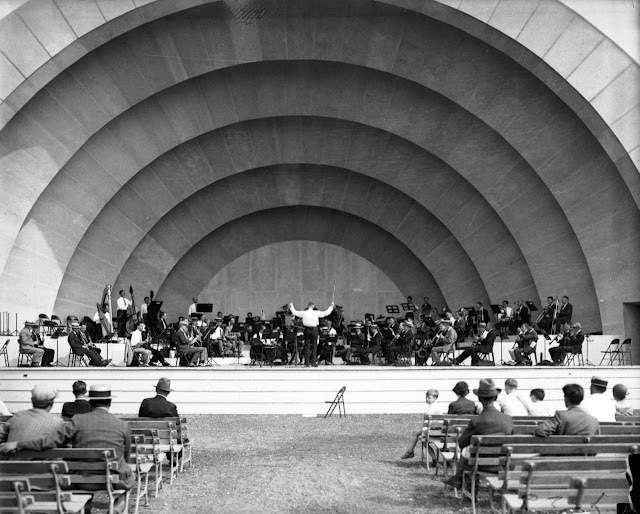 At the height of the Great Depression, Chicagoans began attending free concerts in a new Grant Park facility: the Grant Park Band Shell was located in Hutchinson Field and modeled after the original Hollywood Bowl from Los Angeles, California. It was a classic Chicago two-fer: a cultural asset that also could deliver a few jobs. The Petrillo Band Shell, originally located at the south end of Grant Park in Hutchinson Field. It was modeled after the original Hollywood Bowl. 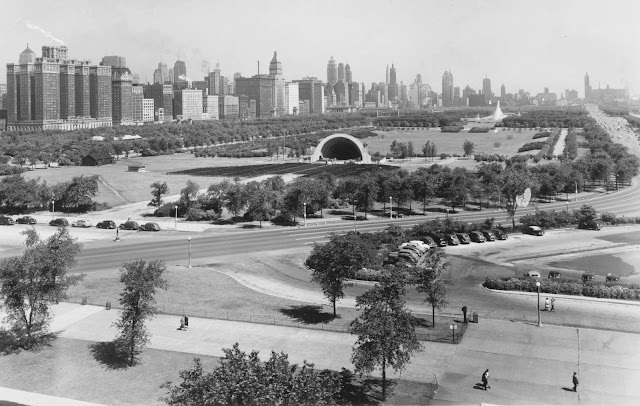 On July 1, 1935, James Petrillo oversaw the beginning of free concerts in Grant Park at the original bandshell located on the south end of the park across Lake Shore Drive from the Field Museum of Natural History and south of the Buckingham Fountain, as seen in the above photograph. By the 1970s the original bandshell had deteriorated to the point where "stagehands, performers and even a grand piano had fallen through the stage floor." Amid the catastrophes, the musicians joked about the need for hard hats. 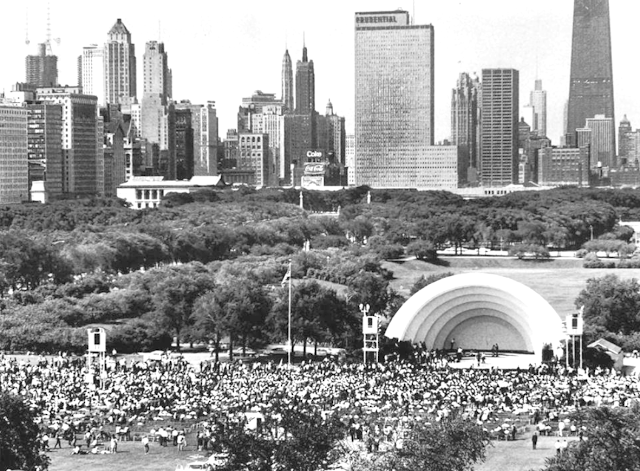 In 1975, the music shell was renamed to honor James C. Petrillo, president of the Chicago Federation of Musicians from 1922 to 1962 and president of the American Federation of Musicians from 1940 to 1958, who created a free concert series in Grant Park in 1935. Petrillo was a commissioner of the Chicago Park District from 1934 to 1945. Despite $77,000 in 1977 repair expenditures by the city, the performers were considering cancelling the 1978 season. In 1972, plans were advanced to build a large new concrete-and-fiberglass band shell atop a new underground parking garage, but community groups defended the Ward restrictions. A compromise produced the inexpensive, staff-designed, demountable band shell at Grant Park's Butler Field, which opened in 1978. The new Petrillo Bandshell, Grant Park, Chicago. The "semi-permanent" designation skirted the Ward prohibitions and the new structure cost only $3 million. 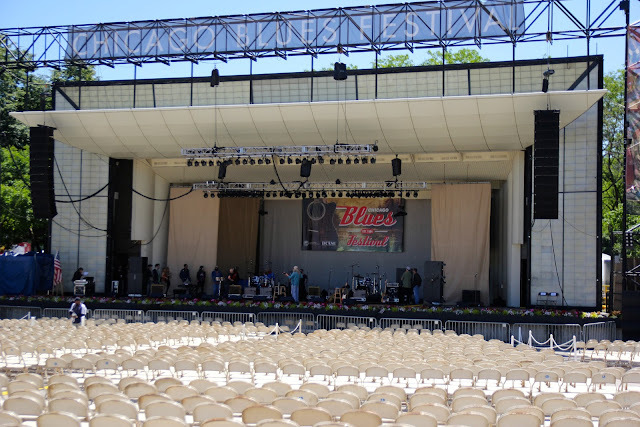 With an official street address at 235 S. Columbus Drive, the music shell encompasses the entire block bounded by Lake Shore Drive to the east, Columbus Drive to the west, East Monroe Drive to the north and East Jackson Drive to the south. This places it a block east of the Art Institute of Chicago, a block north of Buckingham Fountain, and southeast of Millennium Park. The amphitheater and paved surface for public seating is in the southwest corner of the block; facing Butler Field. Deed restrictions dating from the city's early history generally forbid any buildings in Grant Park between Randolph Drive and 11th Place. As the result of a series of Illinois Supreme Court rulings, Grant Park has been "forever open, clear and free" since 1836, which was a year before the city of Chicago was incorporated. In 1839, United States Secretary of War Joel Roberts Poinsett declared the land between Randolph Street and Madison Street east of Michigan Boulevard "Public Ground forever to remain vacant of buildings. Aaron Montgomery Ward, who is known both as the inventor of mail order and the protector of Grant Park, twice sued the city of Chicago to force it to remove buildings and structures from Grant Park and to keep it from building new ones. As a result, the city has what are termed the Montgomery Ward height restrictions on buildings and structures in Grant Park.